For the last several years everything has been about white, grey, light, and neutrals. Who is ready to move forward and be bolder? 2017 is the year that I believe things will change – kind of. People are ready for color. They are ready for bold, and they are ready for warmth. Grey’s Anatomy: We all know gray has almost run its course, right? Wrong! According to forecasts, it should be around for the next 5 years before moving on to an exciting color that I am already seeing roaming around. I’ll tell you more about that later. Sherwin Williams’s color of the year for 2017 is “Poised Taupe.” Pictured above, this color is a very warm and cozy gray that I am pretty excited about. In some lights it almost looks brown. I feel it is the perfect color for someone who has always been a little uneasy about going too grey. I have a lot of client’s who like what they have seen in magazines, but don’t know how to incorporate it into their own spaces with their own furnishings. 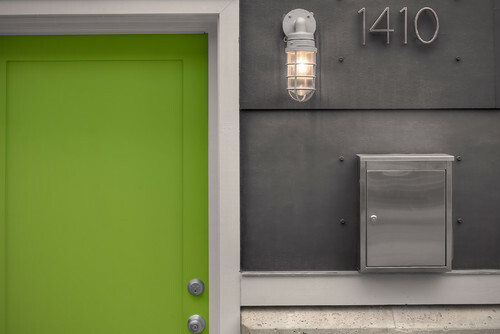 To me, this color of the year is the perfect transition color for this type of home owner. “Light, bright, and airy”: How many designers get this statement from every single client who comes through their doors? - What look are you going for?? - Light, bright, and airy. Do you notice anything about the color of the year for this year? It isn’t LIGHT! It is actually a dark base paint color which is quite the opposite. I don’t think this AT ALL means that people won’t still be wanting the “light, bright, and airy” look, but I do think it provides another option. I think it will help clients to see that this isn’t the only acceptable style. The Farmhouse style is great and I am very inspired by it, but there are other, beautiful ways to design your home, and other beautiful styles to be inspired by. Don’t be afraid of the dark! ​“Blue Ain’t Your Color”: …but it might be the perfect color to use in your home!! When gray fades out, guess what color is going to thrive….. BLUE! I have seen a ton of navy and indigo in design magazines lately. Again, these are dark colors that are paired with our everyday bright spaces that I believe will help people see that light isn’t the only way to go. Blue is one of my favorite colors to use in design! 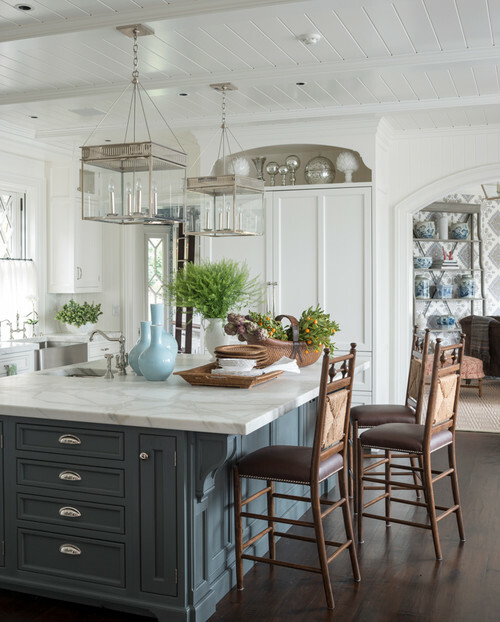 I love neutral finishes and a bold accent color and there are so many blues that will do the trick. For the exterior, blues also make great accent front door colors. Looks like the consumer for 2017 is interested in natural, environmental colors. They are also interested in being bolder with their use of color being inspired by the current market. When the economy is booming, people’s homes should reflect a hopeful, energetic, and lively atmosphere. The Kitchen: Functionally, the kitchen will still feature open floor plans with islands. This just means that people will continue to look for important storage solutions. To have more than one island is even on the rise if the space allows. Kitchens have also historically been located off the of the garage, but with kitchens now being the focal point of the home, client’s prefer to have a buffer space between the garage and the kitchen. This leads to the increase in mud room/ drop zone spaces that offer home owners a place to set down their things without cluttering up the work space. Designing a kitchen for aging in place is a hot trend as well and this isn’t just for older buyers. This is also being done by the younger generation. Universal design improves the quality of life for end users regardless of age. Nature will continue to be a huge influence on design. 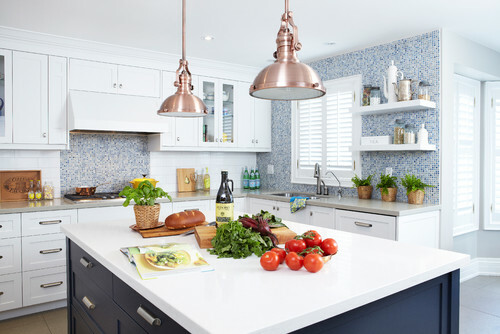 Using natural materials such as wood, granite countertops, and natural stone backsplashes give clients a connection to the environment and promote a healthy lifestyle. 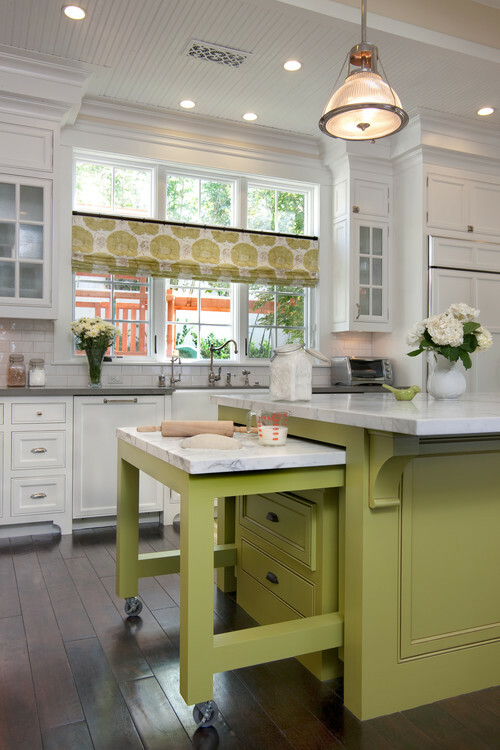 In cabinetry solid white will still be the hottest cabinet trend, but clients will also enjoy incorporating painted colorful cabinet selections. One company I was looking at, Conestoga Cabinetry, has even had a lot of success with a deep reddish-brown pictured below. I am in love with this color!! I’ve had several clients who want to use fun painted cabinets and I have had fun with that. The most popular cabinets I have seen are green and blue. Bolder is better. Most people are afraid to commit to having all painted cabinets in a bold color so having just the island a different color is a way to have fun without being locked into something that is a trend long term. The bottom line is that these are trends and may or may not be around for years to come. Visit my Houzz profile by clicking the link above for more accent island colors! ​The bathroom: Some of this is old news, but people just really don’t care that much about tubs anymore. 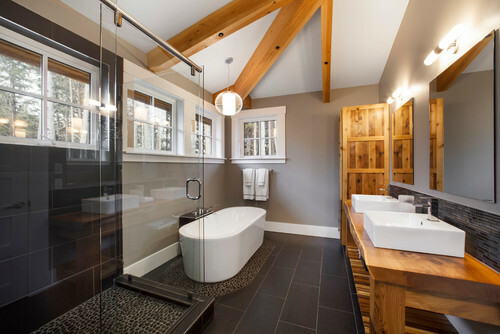 You are more likely to walk into a newly constructed or remodeled home and see a large walk in (or roll in) shower rather than see a cozy shower and a spacious tub. The truth is that the average American just doesn’t have time to sit down for a nice relaxing soak anymore. Tubs are bulky and take up valuable space. On the other hand, there is a huge increase in freestanding tub sales. Because they aren’t built in, they visually take up less space while still offering a large enough setting to sit and relax. Consumers don’t care as much about jetted tubs like they used to, but care more about just having a place to soak (that is if they even want a tub at all). Aging in place is an important aspect of bathrooms as well. According to Dale Contant, President of Atlanta Design & Build, everybody will eventually have a curbless shower regardless of age. He states that clients are wanting “sleek, minimalist, and transitional styles.” The curbless shower offers a sleek look while still serving a purpose. Luckily, companies like #GRABDASHBAR are offering products that help designers incorporate universal design features into bathrooms without sacrificing the look as well. This particular company sells grab bars that are stylish and less industrial in appearance. Today it is so much easier for clients and designers to plan for aging because companies are continually creating items that are aesthetically appealing and functional for us to specify. Thank you so much for reading! Let me know if there is anything yo would like to hear more of!